Do you want to brew a truly impressive cup of coffee? If so, then you simply must add a digital kitchen scale to your arsenal of brewing equipment. 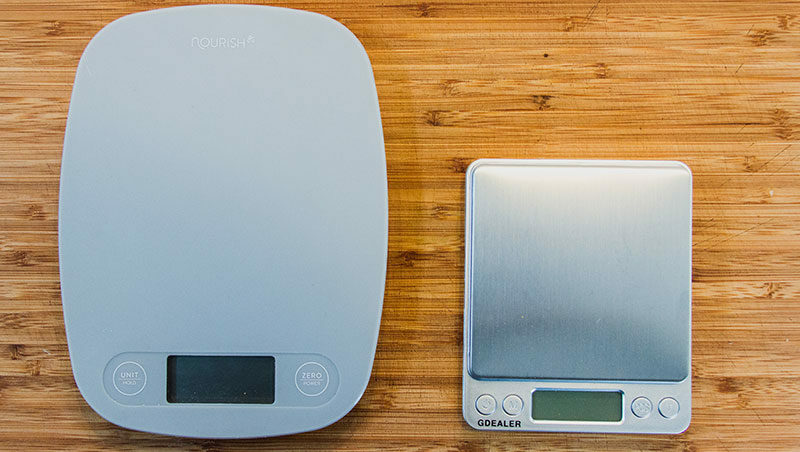 Digital kitchen scales are lightweight, small, and quite easy to use. 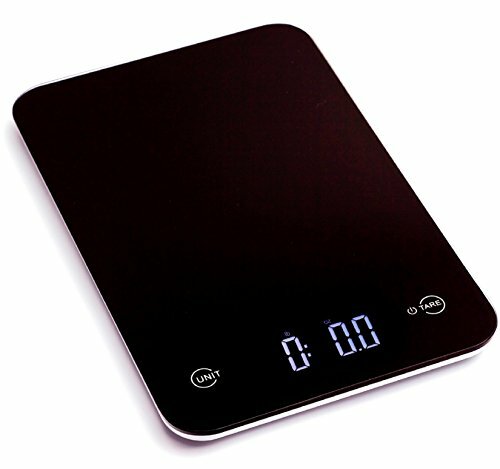 When you want to make sure you have all your measurements correct when you are preparing your coffee, or many other foods and drinks, for that matter, then you are definitely going to want to find a great digital kitchen scale. Don’t Feel Like Reading? I’d recommend the beauty and accuracy of the Ozeri professional kitchen scale.. Click here to check it out on Amazon. 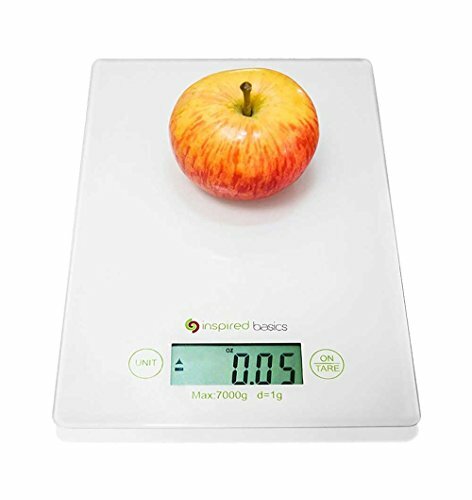 There are many out there to choose from, that is why today we wanted to take a few minutes to take a look at digital kitchen scales, why they are important, and make a few recommendations on some great scales that you can buy for your kitchen. You have scoops and measuring spoons and more already. So why should you bother using a scale in the first place? It’s really quite simple. If you hope to make the absolute best cup of coffee possible, you are going to need a digital kitchen scale. We already know that your water and coffee quality and brew method can greatly influence your coffee, but did you know that above that a proper measure of coffee and water is essential? If you don’t use enough coffee grinds when you brew, your will end up with a rather weak cup of coffee. Use too much and it could be too strong for your tastes. That is where a digital kitchen scale comes in quite handy. You can use it to properly measure both your coffee and even your water so you can make the perfect cup of coffee. I recommend you stick with the metric system on your scale, as the measurements become very easy to do. In the morning when you are still only half awake, this is very important. For example, 1 milliliter of water is equal to 1 gram, and 1 liter is equal to 1 kilogram. What this means is you can not only use your scale to measure coffee, but the amount of water you need to use as well, giving you one tool to find the perfect amount of all the ingredients you will need when brewing a truly spectacular cup of coffee. While we love to focus on coffee here, for obvious reasons, there are many other benefits to owning a digital kitchen scale in your home. On top of coffee, you will find you have many more uses for that digital kitchen scale. Using it, you can measure other types of drinks such as teas if you enjoy brewing tea, and you can even use it to properly measure food if you enjoy improving your culinary skills as well. Really, when you pick up a digital kitchen scale, you will find it to be one of the most used tools in your kitchen as you begin using it for almost everything you prepare in your home. On top of that, it is the perfect tool to make sure you properly measure our coffee, so there is really no reason why you shouldn’t pick up one for your kitchen today. Okay now onto the fun stuff. Well, it’s fun if you enjoy shopping or, at the very least, are on a mission to make a better cup of coffee. Below we have compiled a list of some of our favorite digital kitchen scales that are perfect for aiding you in your quest for that perfect cup of joe. Now, they are in no particular order, so feel free to look through the list and choose the one that best suits your needs and the needs of your kitchen. 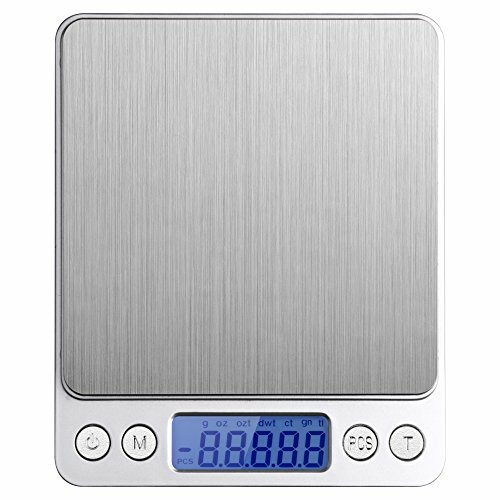 This stainless steel scale has a brushed look that is fingerprint resistant meaning it is also easy to clean. It is equipped with 4 sensors to provide highly accurate measurements and will even give you a readout in grams, ounces, milliliters or pounds. It does auto shut off after 45 seconds to save battery life, but that is a little quick in my book. All in all you really can’t go wrong if you like that brushed stainless look but want accuracy in your scale. Another beautiful stainless scale, this one comes with a very thin and small form factor perfect for those who don’t have a lot of space. It is very user friendly and will measure almost anything from coffee to food to water and with its ability to measure up to 5kg, you will easily be able to measure your coffee and water on this lightweight scale. An amazing scale for anyone looking for something a little more professional, the Ozeri Touch features an ultra thin design coated with strong glass for a great feel. It features four sensors for highly accurate measurements and can hold up to a whopping 12 pounds on its surface. It also features three different color choices perfect for anyone looking to match their existing kitchen. This scale is, admittedly, a touch more basic in design than the others on this list, but that’s what makes it great. It is a no frills approach to measurement giving all the tools you need without any extras that you really don’t need. It is easy to use and feature packed giving you exactly what you need to measure coffee, water, tea or even your food. It is also small and lightweight, so you don’t have to worry about it taking up too much counter space. 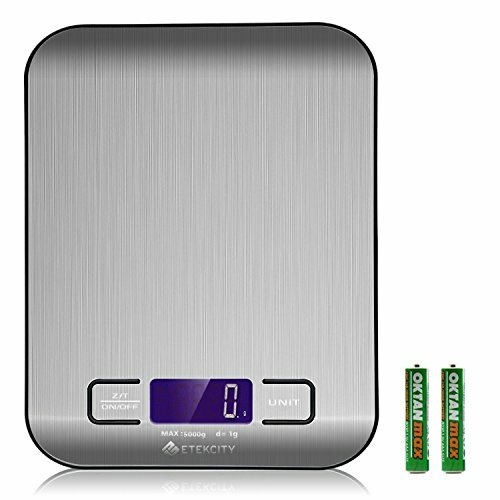 If space is a really big concern, or if you need to take it with you on the road, then you need to take a closer look at the Etekcity Digital Pocket Kitchen Scale. It is very small and lightweight, but it won’t hold as much on the scale before you exceed its limits. Still, you can measure your water and coffee accurately, just don’t try to go overboard and make huge pots of coffee with it. 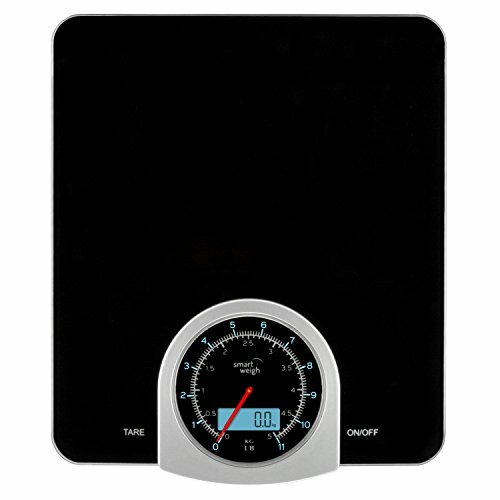 This particular digital scale offers a balance of accuracy and looks making it a great addition to any kitchen. With its high precision gauge sensors you can be confident in your measurements each and every time. It is surrounded in durable glass giving the black finish a great look that will go well in almost any kitchen and its user friendly interface means even the most novice of users will be able to measure with ease. 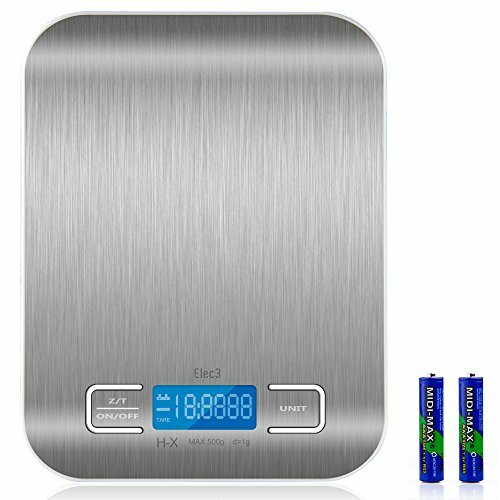 The perfect digital scale for anyone who doesn’t want to give up the classic mechanical scale, this handy kitchen scale gives you both the traditional dial of a mechanical scale along with a digital readout. Its easy to use touch buttons make it perfect for anyone new to scales and its duel measuring features give you more than enough weighing options for your needs. If you want a more classic approach to your coffee measurements, this is definitely the scale for you. While a little bulkier than other scales on this list, the Ozeri Pronto is still small enough to fit in most kitchens, although I wouldn’t try to carry it with you on the road. Designed in elegant chrome, the Ozeri also comes in several different colors to match almost any kitchen decor. It can easily measure all your ingredients and will even automatically subtract the weight of your containers so it is easy to gauge the amounts you need. It will easily handle up to 11 pounds meaning you will be able to weigh almost anything without having to worry about going over. 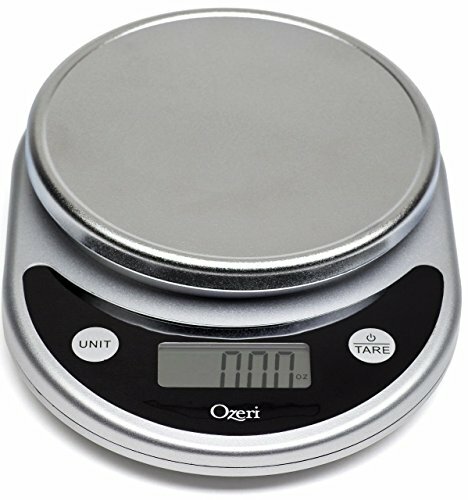 All in all if you are searching for a scale that can do it all and one that is easy to use, the Ozeri should definitely be on your short list of choices. There you have it. 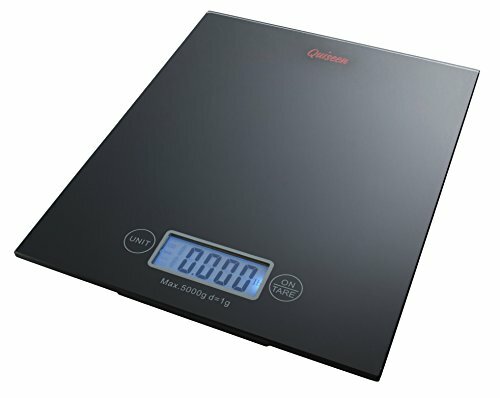 Now you know why you need a digital kitchen scale and you even have some great options to choose from. Remember, proper measurements are only part of the coffee equation, but if you get that right, you will be well on your way to brewing a great cup of java that anyone will rave about. So pick yourself up a digital kitchen scale today so you never go wrong when measuring your coffee and water ever again. The term comes up all the time, but exactly what is an Americano? We're here to break it down for you from the history, to how it's made and what it tastes like. Read on for the full report on this coffee classic.